Because nothing in runway beauty is allowed to be perfect or predictable these days. 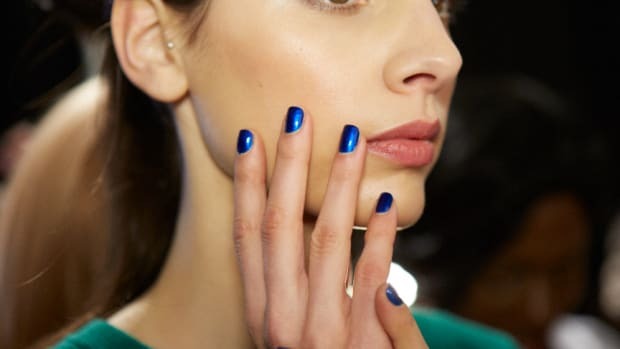 It looks like designers decided to ignore that whole "nail art is dead" thing this season. He's here! He's here! He's here! Kate and Wills' little bundle of Royal joy arrived yesterday afternoon--and enterprising companies certainly aren't wasting any time cashing in on the excitement. The dude doesn't even have a name yet--but he's already inspired a major merchandise craze--and been a helfpul boon to the UK economy, to boot. We know you're dying to get a jump on incorporating emerald, the 2013 Pantone color of the year, into your wardrobe as soon as possible. Sure you could go out and buy this, but we suggest starting out small. Nail polish is the perfect way to go green.